Mangoes hit us a bit late this year, and now that they’re here, time to load up on all versions of the good old mango. Apart from just slicing them and eating them like they’re going out of fashion (but they are! ), from cocktails and divine dessert, savour the King of Fruits in its different avatars! Best known as an Asian fruit, it’s no wonder that The Fatty Bao has stirred up some mango happiness. This time, it’s in the form of the Colour Me Mango festival. From that menu, we cannot get enough of the Mango Cremeux. A black sesame sponge with raspberry gel and sorbet, green tea crumble and nougatine, forget dessert, we can eat a few of these as mains! Over at Monkey Bar, forget everything else and order the Mango Falooda Ice Cream sandwich. Everything you dreamed of as a kid, but was denied then, comes together in this one. Chikki almond ice cream sandwich with vanilla cake, rose syrup falooda and mango jelly with tutti fruiti make up this one. Plus, passion fruit and mango gel to top it off. Keeping it classy, Toast & Tonic’s tribute to the mango is a raw mango parfait. Cutting the fruity flavour is green tea, along with jasmine rice sponge, badam milk and tapioca ice cream. But wait, there is more! Add on some chunks of mango (depending on what variety is freshest at the time), and you have a summer time bae! They have a whole menu dedicated to the king of fruits. Kick things off with drinks such as sparkling wine with mango passion sorbet, or perhaps the Good Ol’ Mango Milkshake. We For mains pick from Pan Seared Salmon that comes with citrus mango, rose apple salad and kairi curry and mango chutney. Citrus Mango and Roseapple salad, Kairi curry, Mon’s Mango chutney in one dish. There’s a chicken wrap which comes with mango slaw, and look delish! End with crepes filled with with mango and mixed berry mascarpone. Oh you want an entire meal with mangoes? Done. Just head over to Esplanade where mangoes meet Bengali food, and how! Start with Kancha Aam Diye Chhanar cutlets or even raw mango steamed fish. Then order the summer favourite of raw mango with eggplant and perhaps the Aam Kasundir Bhindi which is okra in mango mustard sauce. Of course for non-vegetarians, look no further than Aam Posto Chingri which is a gravy of mango, poppy seeds and prawn. Or even Pomfret Bhapa Aam Sorshe which is steamed fish with a mango chilli sauce. There’s plenty more on offer too if you want to really go all out. But make sure to end with Aam Sandesh, Aam Doi (mango yoghurt) and fresh mango with ice cream. Stirring up mango cocktails, it’s all about the booze here. 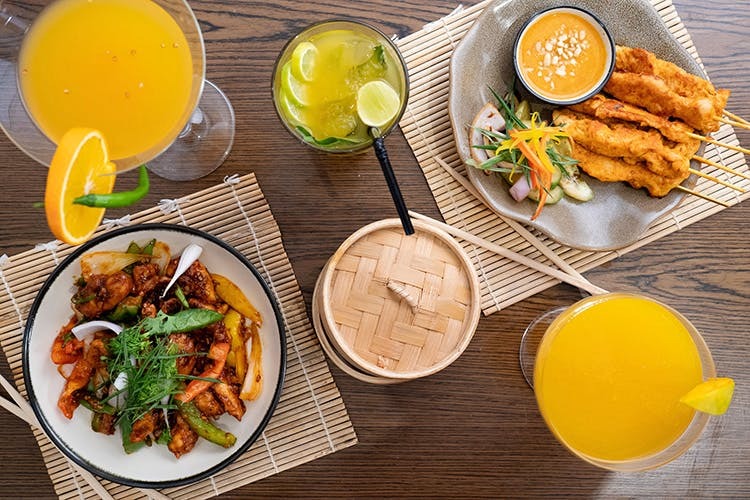 From the Boozy Mango Mogo Iced Tea made up of gin, mango juice and chilled mogo tea and mocktails such as Mango Berry Cooler a concoction of mango pulp, strawberry crush and ice cream and The General, a classic mocktail with mango, lime juice and lychee syrup.